Too many complex words, phrases, and terms slow the learning process - many with subtle differences in meaning among terms - like meosis versus mitosis. Yet, the richness of any communication medium enables innovation, entertainment, and more learning. How do we overcome this conundrum to accelerate learning? Complex terms overwhelm descriptions of most advanced subjects. New terms describe more new terms - resulting in a massive recursion problem. Descriptive recursion: when a word is defined using new terms - each with distractive link that brings more new terms. System recursion: complex systems have parts where each part is another challenging term. As one delves deeper from organisms, to organs, to tissues, to cells, to chromosomes, to DNA, to genes, to molecules, and finally to atoms - the terms can be overwhelming even though the concepts can be easily understood. From my personal experience, whether learning to read 8,000 Chinese characters; mastering the thousands of cross-platform terms and packages used to describe the iPhone, Android, webos, and IE9 mobile coding; dealing with legal terms; or conquering the 4,000-term biology project - the recursion problem has slowed learning even though the fundamental lessons are relatively simple. Learning starts with observing objects, patterns, and systems. Kids start with images of objects and associate with words - both written and spoken. What we read is often descriptions of objects, patterns, and systems. Patterns can be informal descriptions like two objects look similar or formal classes with an ordering and agreed-to method like the taxonomy structure for organisms. Overcoming superficial patterns to learn subtle differences leads to the type of learning that results in future jobs. Systems describe parts, materials, functions, and processes. An object can have one or more subsystems; and also be parts of larger systems. The main systems inside humans include circulatory, digestive, excretory, immune, muscular, and sensory; but humanoids are also parts of societies, communities, and ecosystems. Recognizing and creating patterns, diving into systems and learning how they work, and understanding the role of objects in larger systems - isn't that the fundamentals of learning? and innovation? Parts describe components of a system like bones, muscles, and connective tissues. Materials categorize disposable parts like enzymes and hormones. Function describes the general use of an object. Process describes the steps that a system of parts use to coordinate the function. Methods describe human-developed steps for analysis. The comparative reproduction chapter of the Bio AP collection shows an example of this Keys-pattern at work. The overall process unites an egg and sperm. 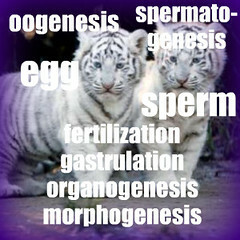 Oogenesis and spermatogenesis describes systems for producing these key parts. These lessons include the parts, materials, and processes where the end result is a gamete. Fertilization, gastrulation, organogenesis, and morphogenesis follow the formation of a zygote. 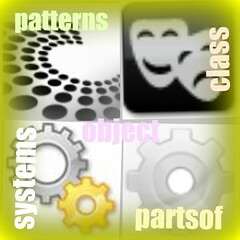 Each is a system with parts, materials, and process. The chapter further compares the process for bacteria, protists, invertebrates, amniotes, and mammals. One picture provides the overall pattern that helps to categorize the richness of the reproductive subject matter -covering the tough terms and concepts for accelerated comprehension of a dozen chapters in college-level textbook. Examine the overview of a chapter and learn the fundamentals of the top view. Do this before reading textbooks - i.e. know the basic terms prior to reading. Practice with each chapter after reading the textbook - to cement memorization of the key terms. It's not necessary to memorize every term. It is important to learn many terms, and see the context of words within a subject matter. Use the games to associate terms with images; and self-entertain as a small motivator to spend time learning. Practice prior to tests like the SAT. Remember that even when working, search is just one step away. Understanding that leads to comprehension of the search or wiki results is our goal. When you read web content and recognize right from wrong information among the billions of pages - that's Nirvana! As with all emerging systematics, differences in opinion and discovered facts cloud any new method. Our goal is to shape buckets of complex terms by placing them into a context that is easier to remember. Work with us to improve the learning process. Update for March, 2011: 1,700,000 have downloaded the Keys app. Thank you.